I have sold a property at 1204 821 CAMBIE ST in Vancouver. The Raffles on Cambie and Robson. The most convenient location with high end Miele appliances and custom fridge, freezer, 2 bedrooms and 2 full baths northeast corner unit, floor to ceiling windows. Enclosed bright den and additionalinsuite storage. Close to library, BC Place, Robson & Yaletown and all amenities. Easy to show. I have listed a new property at 201 2288 12TH AVE W in Vancouver. This is a two bedroom and den, two bath, two parking stall, two balcony, oversized apartment in a rainscreened building with a new a roof going on right now. House sized furniture fits easily in these generous rooms and the den is largerthan most bedrooms. The kitchen and master ensuite have been renovated by Lonetree. This Northwest corner suite overlooking Connaught Park is big, bright and beautiful with large windows and a great floorplan. An easy walk to the Community Centre, London Drugs and IGA. A one of kind suite in a Arbutus Walk. YOU'LL LOVE IT! VANCOUVER, B.C. 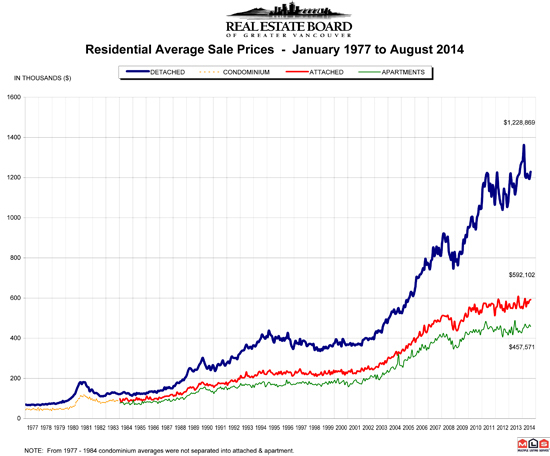 – September 3, 2014 – The Metro Vancouver housing market experienced steady home sale, listing, and pricing trends for the month of August. The Real Estate Board of Greater Vancouver (REBGV) reports that residential property sales in Greater Vancouver reached 2,771 on the Multiple Listing Service® (MLS®) in August 2014. This represents a 10.2 percent increase compared to the 2,514 sales recorded in August 2013, and a 9.5 percent decline compared to the 3,061 sales in July2014. Last month’s sales were 4.3 percent above the 10-year sales average for August of 2,658. The MLS® Home Price Index composite benchmark price for all residential properties in Metro Vancouver* is currently $631,600. This represents a 5 percent increase compared to August 2013. “Broadly speaking, home prices in the region are continuing to experience modest, incremental gains,” Harris said. New listings for detached, attached and apartment properties in Metro Vancouver totalled 3,940 in August. This represents a 5.9 percent decline compared to the 4,186 new listings in August 2013 and a 20 percent decline from the 4,925 new listings in July. Last month’s new listing total was 8.4 percent below the region’s 10-year new listing average for the month. The total number of properties currently listed for sale on the MLS® system in Metro Vancouver is 14,768, a 7.9 percent decline compared to August 2013 and a 5.4 percent decrease compared to July 2014. Sales of detached properties in August 2014 reached 1,158, an increase of 10.1 percent from the 1,052 detached sales recorded in August 2013, and an 85.6 percent increase from the 624 units sold in August 2012. The benchmark price for detached properties increased 6.6 percent from August 2013 to $984,300. Sales of apartment properties reached 1,126 in August 2014, an increase of 10.6 percent compared to the 1,018 sales in August 2013, and a 55.3 percent increase compared to the 725 sales in August 2012. The benchmark price of an apartment property increased 3.6 percent from August 2013 to $379,200. Attached property sales in August 2014 totalled 487, a 9.7 percent increase compared to the 444 sales in August 2013, and a 62.3 percent increase over the 300 attached properties sold in August 2012. The benchmark price of an attached unit increased 3.9 percent between August 2013 and 2014 to $474,900.